NN4QQ: Stone Mountain Hamfest - Extra Extra - Read all about it. 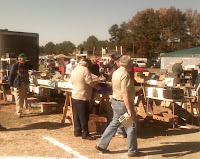 Stone Mountain Hamfest - Extra Extra - Read all about it. I recently attended the Stone Mountain HAM Fest near Atlanta, GA. This is the area's largest and best featuring lots of vendors and bone-yard tables. The weather could not have been better, and I was able leisurely walk around slowly eying up lots of great deals on new parts for my JUNK BOX, and I also passed my EXTRA exam, DX here I come! So it is Mr. ki4SGU/AE if you please. Among the electronics treasures I found, were four variable caps (3x 4-100uF & 1x 75-350uF), all less than $2 ea. 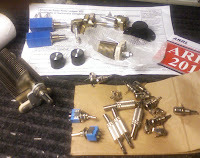 I also stocked up on mono audio plugs for the upcoming PIXIE build, and some nifty multi turn 10K pots, and 2 new 10m ham-sticks for a ham-stick dipole for any future LX peditions. The crowds were fairly large, even folks taking the Hams test numbered more than 40. With the testers and the all star VEC crew made for tight quarters while testing. For all you Yaesu fans, they will be offering a new APRS & GPS dual band radio, the FT350. For the Kenwood crowd, they will be offering two new models a new HT (a super new version of their popular Kenwood TH-D7AG Data Communicator) and a new HF (a super new version of the Kenwood TS-570SG). It is all hype now, but the booth guys were bragging about a k3 beater on RX. I was not able to find any pictures to share here, but I did find a video which I saw in person at the Kenwood booth, I found a version it here on YOUTUBE ICOM did not attend this year, but our old faithful friends MFJ and HRO were so busy, I did not fight the crowds to get a peak, or even a new catalog. 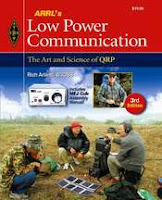 I also attended a very folksy and entertaining forum by the author of ARRL's Low Power Communication Guide, The Art and Science of QRP By Richard H. Arland K7SZ. Ham Radio and Ham Radio Festivals are alive in well here in Georgia.